Give your child the opportunity to tell "Santa Claus" what he/she wants for Christmas. On Wednesday, December 19, 2012, your child can receive a personal call from Santa! 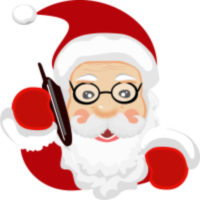 • Best Time to Call Between: 5:30 p.m. - 8:00 p.m.
*Please note, this program is a phone calling service from Santa and Mrs. Claus and NOT a gift giving service. Please remember the day/time you have selected as Santa will be making a lot of calls and it is very difficult to make multiple calls to the same number. Or drop it by the special North Pole mail boxes located at the Oak Street Park Community Center, Chamber’s Park Community Center, Kissimmee Civic Center, Lakeside Recreation Center, or City Hall. Don’t let your child miss out on this memorable moment!! DEADLINE: Friday, December 14, 2012, or if mailing, envelopes must be postmarked by December 12, 2012.